Racial identity theories have been in the psychological literature for nearly thirty years. 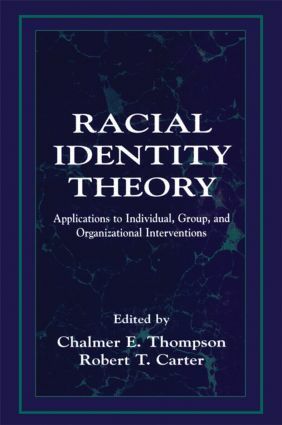 Unlike most references to racial identity, however, Thompson and Carter demonstrate the value of integrating RACE and IDENTITY as systematic components of human functioning. The editors and their contributors show how the infusion of racial identity theory with other psychological models can successfully yield more holistic considerations of client functioning and well-being. Fully respecting the mutual influence of personal and environmental factors to explanations of individual and group functioning, they apply complex theoretical notions to real-life cases in psychological practice. These authors contend that race is a pervasive and formidable force in society that affects the development and functioning of individuals and groups. In a recursive fashion, individuals and groups influence and, indeed, nurture the notion of race and societal racism. Arguing that mental health practitioners are in key, influential positions to pierce this cycle, the authors provide evidence of how meaningful change can occur when racial identity theory is integrated into interventions that attempt to diminish the distress people experience in their lives. The interventions illustrated in this volume are applied in various contexts, including psychotherapy and counseling, supervision, family therapy, support groups, and organizational and institutional environments. This book can serve the needs and interests of advanced-level students and professionals in all mental health fields, as well as researchers and scholars in such disciplines as organizational management and forensic psychology. It can also be of value to anyone interested in the systematic implementation of strategies to overcome problems of race.